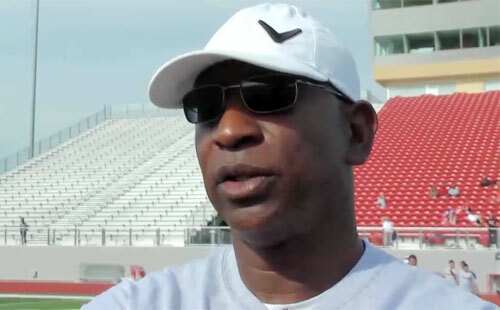 CONVERSE, TX — Pro Football Hall of Famer, Eric Dickerson, will once again be on the field, for his sixth year at the annual Judson Football Camp for the two-day skills and fundamentals camp where he will mix it up with the group of kids ranging from second-graders through high-schoolers. The camp will run from 9 a.m. to 1 p.m. June 6 and 7 at D.W. Rutledge Stadium on the Judson High School campus in Converse. The cost is $30 per athlete per day. Every participant receives an autographed T-shirt and refreshments. Source: mysanantonio.com. Opening day is Offense Day and will include skills sets for ball handling, receiving, passing and blocking. Day two is, naturally, Defense Day, when drills will focus on pursuit, tackling and secondary skills. Each day, drills will conclude in time for a 12:45 p.m. guest speaker. The camp is structured for football players of all levels of experience. One of the areas of growth over the past few years has been in the high school age group. Part of the camp’s appeal is its instructors, many of whom had played in the NFL. Dickerson, inducted into the NFL Hall of Fame in 1999 and who still ranks No. 7 on the league’s all-time rushers list, has run the camp each of its first five years. Last year’s guest instructors included two-time Pro Bowler David Hill, five-time Pro Bowler Anthony Miller and former Dallas Cowboys receiver Jessie Holley. In addition to teaching the kids and helping them to develop their games, having them learn safely is always a concern for Dickerson and his staff. 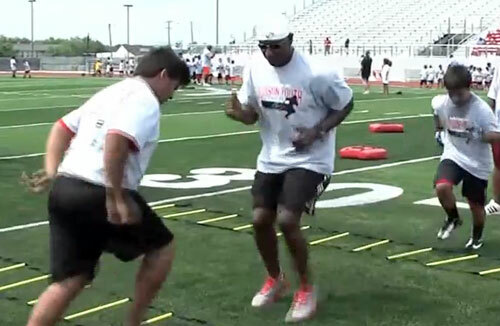 In June 2013, The Judson Education Foundation’s Football Camp saw its biggest group of campers yet at around 250. It was two days of sweating, drilling and most of all learning. The JEF Football Camp headed up by NFL Hall of Fame running back Eric Dickerson also brought some other All-Pros as well. Former Ram teammate Leroy Irvin (defensive back), and former Pro Bowl Dallas Cowboy Center Andre Gurode were also there working and encouraging the kids through the drills. 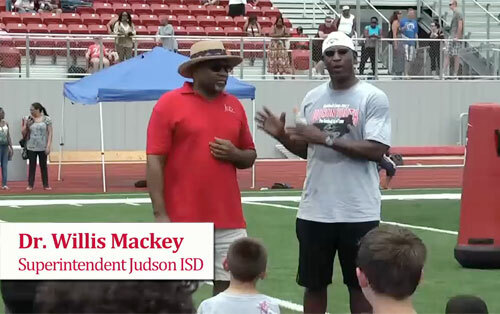 The event was a great teaching tool for area athletes to get better in their techniques and confidence and it is always a great way to raise money for the Judson Education Foundation. JEF provides scholarships for students going on to further their education in college. It also funds grants to help support innovative teachers with supplies and tools to do their job more effectively. Eric Dickerson is a former running back who played professionally for the Los Angeles Rams, Indianapolis Colts, Los Angeles Raiders, and Atlanta Falcons for eleven seasons during the 1980s and 1990s. He was selected in the first round of the 1983 NFL Draft. During his NFL career, he rushed for over 13,000 yards. He holds the NFL’s single-season rushing record with 2,105 yards, set in 1984. In 1999, he was elected to the Pro Football Hall of Fame. During the 2007 football season, Dickerson worked as a broadcaster for KCBS television in Los Angeles, providing commentary for NFL pregame and postgame shows. Dickerson became the seventh back to gain more than 10,000 yards and the fastest ever to do so, reaching the milestone in just 91 games. During his 11-year career, Dickerson gained 13,259 yards rushing, which was second all-time at the time of his retirement, and rushed for 90 touchdowns. He gained another 2,137 yards and 6 touchdowns on 281 pass receptions. A six-time Pro Bowl selection, Dickerson was All-Pro in 1983, 1984, 1986, 1987 and 1988. In 1999, his first year of eligibility, Eric Dickerson was selected to become a member of the Pro Football Hall of Fame. In 1999, he was ranked number 38 on The Sporting News’ list of the 100 Greatest Football Players. The following year, he provided on-field commentary during Monday Night Football broadcasts. The Rams retired Dickerson’s No. 29 and he was inducted into the Indianapolis Colts Ring of Honor during the week 15 game against the Houston Texans on December 15, 2013 along with Marshall Faulk, who is also a former Colts running back, Dickerson is also a popular motivational speaker as well as giving back by helping the youth of America through various football camps such as Camp Pendleton and the Judson Football Camp. Sports Speakers 360 is a booking agent for pro athletes. If you would like to book Eric Dickerson for a speaking engagement, appearance or endorsement, contact Eric Dickerson’s booking agent for fees at 1.855.303.5450.